We have a versatile range of canopies and components that can be used to create various configurations of platform canopy. The range goes from complete printed canopy sections that just need to be placed end to end on your layout, through to individual truss, column and roof components that can be easily assembled to create your own individual design. This section of canopy contains two columns, a central spine truss and a series of roof trusses supporting a semi glazed roof - all printed as a single object. Combine with Canopy Section 2 and Canopy Section 3 to create detailed platform canopies with the minimum of modelling time. This section of canopy can be combined with Canopy Section 1 and Canopy Section 3. 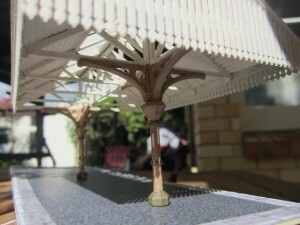 The canopy section incorporates a semi-glazed roof on trusses with a central spine truss, all printed as a single object. This is a cantilevered canopy end section. You can fix it to the end of Canopy Section 1. End sections are available handed to suit roof pattern. This is a right handed end section. This is a cantilevered canopy end section. You can fix it to the end of Canopy Section 1. End sections are available handed to suit roof pattern. This is a left handed end section. This section of canopy contains two columns, a central spine truss and a series of roof trusses - all printed as a single object. Just add your own roof with card or plasticard. Combine with Canopy Section 2 and Canopy Section 3 to create detailed platform canopies with the minimum of modelling time. This section of canopy can be combined with Canopy Section 1 and Canopy Section 3. The canopy section incorporates trusses with a central spine truss, all printed as a single object. Just add your own card or plasticard roof. This is a cantilevered canopy end section structure without roof for you to fix your own card or plasticard roof. You can fix it to the end of Canopy Section 1.